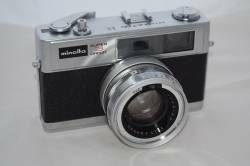 Описание: The Minolta Hi-Matic 11 is a 35mm film rangefinder camera manufactured by Minolta Camera Co.,Ltd., Osaka, Japan with shutter priority automatic exposure and introduced in 1969. The Minolta Hi-Matic 7S and Minolta Hi-Matic 9, both released in 1966, were slightly improved versions of the popular Minolta Hi-Matic 7. The Minolta Hi-Matic was the same as the Minolta Hi-Matic 7S with the addition of a slightly faster f/1.7 lens. The Minolta Hi-Matic 11 was a version of the Minolta Hi-Matic 9 with no manual controls. It is a typical 1960's camera considering its size, close to the Konica Auto S2 and the Yashica Electro 35. The Hi-Matics always had an automatic exposure mode. The original Hi-Matic had it controlled by a selenium meter, plus a flash mode with shutter speed 1/30 sec. and manual aperture control. Later Hi-Matics had CdS meters, always placed within the filter ring.